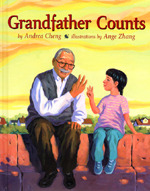 Synopsis: From amazon.com: Gong Gong (Grandfather) is coming from China to live with Helen's family. Helen is excited, but anxious. How will she and her siblings, who only know English, communicate with Gong Gong, who speaks only Chinese? At first Gong Gong keeps to himself, reading the Chinese newspapers he brought with him. Then one day, as Helen sits outside watching for the train that runs behind her house, Gong Gong joins her. He starts counting the train cars in Chinese, and then teaches Helen the words. Helen reciprocates by teaching Gong Gong to count in English. Soon Helen and Gong Gong are teaching each other more words, and a special bond between them begins to develop and grow. A moving intergenerational story, Grandfather Counts highlights the universality of the love shared between grandparent and grandchild, a love that helps them cross the boundaries of language and culture. • There is a pronunciation guide on the copyright page. • Do you have grandparents? • Where did your grandparents grow up? Where do they live now? • Do you talk to your grandparents? • Can you count in another language? • Can you speak another language? Did you have to go to school to learn another language? • Do you have a name besides your English name? • How did you get that name? Your grandparent, parent, friends, brother/sister? • How high can you count in another language? • How high can you count in Chinese? • Make a paper train. Take a piece of paper and fold in half “hot dog” style; fold it in thirds. Draw a train on the paper and cut . On the first train car, draw a “1" in English and then in Chinese character; on the second train car, draw a “2" in English and then in the Chinese character, etc. • Draw a picture for your Grandparent and write Chinese characters on it. Use the guide on the copyright page.